This article originally appeared on The New York Times. Read it there. On a Sunday evening a few weeks back, Shobana Ram was loading the dishwasher in her kitchen in Queens when her 85-year-old father-in-law rose from the dinner table, carrying his cane in one hand and an empty plate in the other. She dialed 911 and thought, not for the first time, how fortunate it was that in 2016 she and her husband sold their house and bought one big enough to accommodate six people: themselves, their two teenagers and his ailing parents, plus the family dog. Her mother-in-law, who has dementia, would not have been able to phone for help. In this case, after emergency room scans, her father-in-law was “miraculously OK,” said Ms. Ram, 48. In an Indian-American family, a household encompassing three generations isn’t uncommon. “There’s an understanding that parents could be living with us at some point,” Ms. Ram said. Yet her family’s decision also reflects a growing change in the way Americans, including older people, are choosing to live. A brief backward look: After the late 1800s, as two economists pointed out in a landmark 2000 study, most elderly widows lived with one of their children — so common a practice that it developed a nostalgic sheen, enshrined as the way things ought to be. In 1940, however, that arrangement started crumbling. The proportion of older widows living with children declined from about 60 percent that year to 20 percent by the 1990 census. Did Americans stop loving their mothers in 1940? No, but their parents began receiving checks from a just-enacted New Deal program called Social Security and no longer had to rely financially on their families. A decade or so ago, as demographers began reporting an uptick in shared and multigenerational housing, the trend again looked to be economically driven, this time by the Great Recession. A Census Bureau report noted that the number of shared households had jumped more than 11 percent between 2007 and 2010. The spike came primarily from younger people — buffeted by unemployment, foreclosures and student debt — moving in with their parents or other relatives. “It was a way to make ends meet,” said Laryssa Mykyta, co-author of the report, now a sociologist at the University of Texas Rio Grande Valley. Let’s pause for some definitions. Though shared households and multigenerational households may overlap, they aren’t identical. When a householder lives with at least one adult who’s not a spouse,partner or college student, that’s a shared household; its members need not necessarily be related. A multigenerational household, as defined by the Pew Research Center (the census uses a different standard), includes at least two generations of related adults, or grandparents and grandchildren. Both phenomena increased during the recession — and interestingly, long after its end, they haven’t declined. Multigenerational households, which hit a historic low of 12 percent of American households in 1980, reached 19 percent in 2014, Pew reported. “You have to conclude that this is a phenomenon that has legs and will continue,” said D’Vera Cohn, co-author of the report. In pre-recession 2006, For example, 20 percent of those aged 85 and older lived in multigenerational households. By 2014 the proportion had climbed to 24 percent. Richard Fry, a Pew senior researcher, has uncovered a similar trend in shared living. Although younger people remain more likely than other age groups to live in someone else’s household, the proportion of older people in those arrangements has also increased. Last year, 14 percent of adults in a shared household were parents of the household head, double the proportion in 1995. What’s creating this reversal of a decades-long trend? About a quarter of non-Hispanic white adults shared a household last year, his analysis shows. But 40 percent of blacks lived in shared households, and 42 percent of Asian-Americans (who have higher median household income than the national average, underscoring that economics probably isn’t the primary driver). So did nearly half of Hispanics. Shared housing is a more common practice among immigrants, another growing segment of the population. For multigenerational households, the numbers “tell a similar story,” added Ms. Cohn. “I think this is a change in what the typical American family looks like,” said Sarita Gupta, co-director of the nonprofit organization Caring Across Generations. 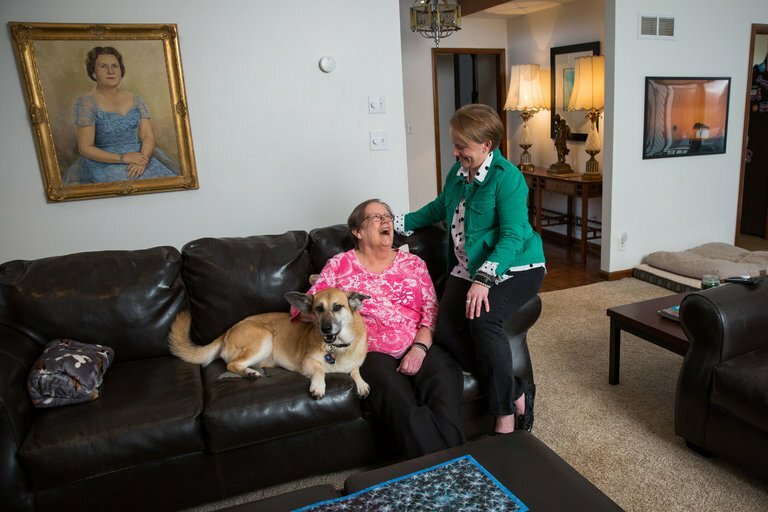 Three years ago, she moved her own parents, in their 70s and struggling to cope with her father’s Alzheimer’s disease, into her home in Silver Spring, Md., with her husband and young daughter. Let’s not romanticize this practice. Those who’ve undertaken it caution that shared households demand tough adjustments — physical, financial and emotional. Shobana Ram knows that her in-laws, who have a home health aide while her family is at work and school, are happier with them than in any assisted living. She sees her children learning important lessons, too. She and her husband tell themselves they’ve made the right choice, for now. Whether shared and multigenerational households continue to increase remains an open question. Perhaps, as immigrant families assimilate and minority group incomes increase, more will opt for separate homes. Susan Yarbrough thinks it does work pretty well. She got a call from her mother in Huntsville, Ala., on her 80th birthday. “It’s time for me to move,” Betsy Yarbrough told her daughter. She found a split-level in suburban Johns Creek, where her mother, now 83, has the ground floor bedroom, bath and den, while she lives upstairs. Betsy Yarbrough contributes to the mortgage and utility costs. Her daughter does more driving to doctors’ offices than she’d expected, but now has a live-in dog sitter.